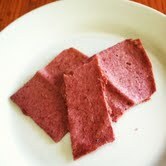 I found this great fruit leather recipe over at Homestead Survival. This is my first attempt at trying to dehydrate fruit. I am excited because this could be a big hit with the boys. 1. Fruit of your choice (I used 1 banana and 1 cup strawberries). 2. Preheat oven on the lowest temperature~ mine is 170 degrees. 3. Warm the fruit in a pot on the stove and mix it into a puree. I used my blender for this part. 4. 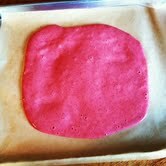 Spread the puree on parchment paper (1 1/2 cups of fruit is enough for one sheet). 5. Place in oven, leave the oven door open a little bit to let the moisture out. 7. I started checking mine at 5 hours which was a little too long. The middle was still sticky, but not the sides. 8. Start checking at 4 hours. That is when mine were probably done. 9. Use a sharp knife or rolling pin to cut when still warm. Roll them in parchment paper. Great healthy fruit snack. Mine were more like fruit chips this time, but we will be back to try them again. And the boys still loved them even though they were a little stiff 🙂 Kitchen experiments! I will be posting another one soon, and hopefully this time it is a success!